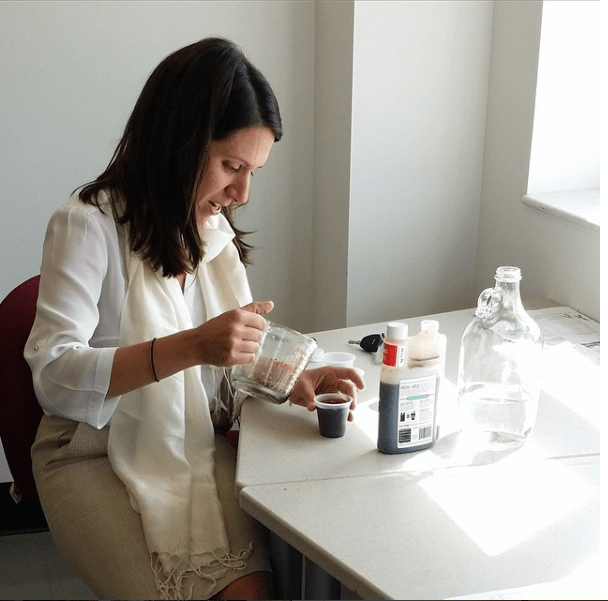 Bebe Goodrich ’07 doesn’t own a drip coffee maker, but she has built a fast-growing business cold brewing coffee in the tradition of her native New Orleans. “I only own a French press and a Toddy,” she said, referring to two lesser-used methods for brewing hot and cold coffee at home. Goodrich started her company, Icebox Coffee, like many entrepreneurs — in her garage in Birmingham, Alabama. She brews a specially sourced coffee that is ideal for her cold brew method. “Cold brew coffee is what we call low and slow,” she said. It takes 20 hours to brew at ambient temperature, using a reliable water source and a good processing system. Her method is based on her early years in New Orleans, where her father roasted coffee for fun, and she became accustomed to the rich, flavorful taste of his and her grandmother’s cold coffee, which they kept in their iceboxes. “I didn’t realize I had become a coffee snob,” she laughed, until she left New Orleans and couldn’t find the same coffee experience in other cities. Entering Washington and Lee as a physics major, Goodrich got to know her advisor, William F. Connelly Jr., the John K. Boardman Professor of Politics, who encouraged her to learn more than math. “He made me read, and I didn’t like to read or write,” she said. Connolly convinced her that if she couldn’t communicate well, she would not succeed. Following his advice, “made my life more dynamic and helps me move my message forward,” Goodrich said. She changed her major to political science and after graduation, went to work in Washington, D.C., for Rep. Rodney Alexander from 2007-10. Another change in her life came when she married fellow alum Thomas Goodrich ’07, and moved to his hometown of Birmingham. For the first year, she worked for a nonprofit organization, but began to realize her skills were more suited to a manufacturing environment. The W&L network helped her when she met Hatton Smith ’73, owner of Royal Cup Coffee and the resident mentor for W&L grads in Birmingham. Smith gave her a part-time job working in product development for RCC while she started Icebox Coffee in 2012. After the birth of her second child, Goodrich decided to leave RCC and concentrate on building Icebox Coffee. With a goal of going national, she started small, selling online to family and friends and going to farmers’ markets. Soon she had a solid customer base and expanded into independent grocery stores and restaurants. Now featured in Whole Foods stores in the Southeast and Florida and Central Market in Texas, the company is experiencing 200- to 300-percent growth per year, she said. Another break came when Cheesecake Factory restaurants began offering her coffee in 2016. She now employs 10 people: four full time, two part time, and several high school and college interns, who work in manufacturing and business operations. Goodrich says that her W&L experience was critical to her success. She became “literate,” and the W&L network has helped her with jobs and resources to start her business. She attributes everything that fell into place during her first year in business to “one degree of separation” from W&L. She also models her business values after the integrity and honorable lifestyle taught at W&L. “That is how we run our business. We feel proud that we can grow in a way that we feel good about, with integrity and transparency.” She says the core values of her business reinforce the right decisions. In addition to learning communications skills at W&L, Goodrich also learned to always be prepared. In her Lincoln’s Statesmanship class, Lucas Morel, the Class of 1960 Professor of Ethics, called on each student during every class. “I learned to be prepared, to be part of the discussion. That has served me extremely well,” she said. Goodrich sometimes thinks about going to work at a normal job, but whenever those thoughts nibble at her during a bad day, “Thomas reminds me that if I had a normal job, others would not have a job.” She is proud to be an employer who can create jobs and train the next generation of entrepreneurs. Goodrich expects her company to continue to grow. “Our category — cold brew coffee — is on fire,” Goodrich said. In Whole Foods alone, there are six competitors on the shelves, and some coffee shops are now cold brewing their own versions. Future plans for Icebox Coffee include a soda product and a tea product, in addition to the New Orleans, Madagascar Vanilla and decaf concentrates and ready-to-drink cold brew coffees she currently sells.